The Regenerative Stormwater Conveyance (RSC) Project Sighting and Design Training for Contractors - is being offered to help further the understanding and science behind the RSC stream restoration technique. 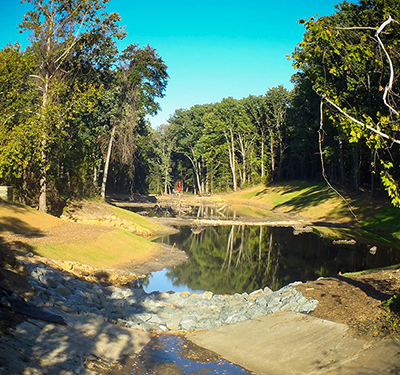 This Best-Management Practice (BMP) is being applied throughout Maryland’s Coastal plain as a remedy for degraded streams, with the goal that the RSC will help stem the flow of uncontrolled stormwater runoff while providing the maximum aquatic and riparian habitat benefits. The basic concepts of the RSC is to replicate a coastal plain stream channel. Unfortunately interpretation by practitioners of how to properly site and design this BMP is not always well understood. Thus the full benefits of this stream restoration and channel design technique are not met on many construction sites. The RSC restoration method is one regularly utilized and we would like to ensure that our partners and contractors fully understand where and how to properly site a RSC, build one in a more prescriptive way, and have the skills and information they need.